Strategy is one of the most widely used, and misused, terms in business. Some leaders believe their strategy is what differentiates them in today�s complex and fluid business environment; while others recognize the value of having a strategy but think strategic planning is dead. What Should an Organization Be Doing? Harvard Business School was one of the first institutions to introduce strategic planning methodologies to the business world. In the early 1920s Harvard introduced the Harvard Policy Model. In this formal model, strategy is defined as a pattern of purposes and policies defining the company and its business. This was the accepted definition until the late 1950s when strategic planning turned from organizational policy and structure toward the management of risk, industry growth, and market share. Enterprises recognized this approach to strategic planning as the portfolio model. Yet management professor George Steiner, often referred to as the father of strategic planning, boiled corporate strategy into a simple question: What should the organization be doing? To paraphrase Richard Rumelt, Professor of Strategy at UCLA�s Anderson School of Management, a good strategy is one that is responsive to change and builds and stretches resources to yield competitive advantage. When done well, strategic planning can provide a real competitive advantage, and an enterprise is likely to always know what it should be doing for each business cycle. What Is Driving the Decision-Making Process? Unfortunately, business leaders and planning managers know all too well that strategic planning does not drive a company�s critical decision-making processes. More than 70% of strategic plans are nothing more than budgets rolling up and down an organization. Figure 1. 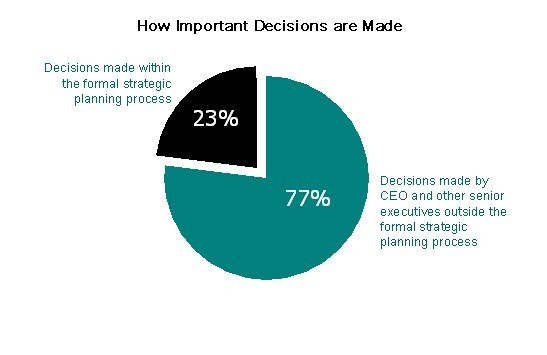 A McKinsey survey has indicated that 23% of a company�s important strategic decisions are made within the formal strategy process; therefore, approximately 80% of all important decisions fall outside of the formal planning process and are made by a CEO or other senior executives (see Fig. 1). Non-integrated, disparate planning systems is what forces executives and managers to make decisions, and it is this disjointed decision-making environment that creates excessive costs and restricts and organization�s ability to identify potential risk and emerging opportunities. Business leaders, academic gurus, and consulting firms have proposed new methodologies for improving the planning process, including Balanced Scorecard, the Strategy Focused Organization, the Beyond Budgeting Roundtable, and others. While they have offered advanced planning processes and business modeling alternatives, they have not addressed the real issue � integration. Business leaders cannot effectively evaluate strategic alternatives or allocate resources without first understanding their company�s collective performance drivers. Siloed planning within departments or business units allows management, at best, to make only well-educated guesses. Even minor assumptions can have a major impact on a company. In some cases, erroneous assumptions have led to incorrect decision-making � leading some to miss their mark by as much as 200%. Projections that are off by this much can affect a company�s top (total revenue) and bottom line (net income). Adding to this difficulty is the fact that many managers have to make decisions based on incomplete historical data and poor analytics; consequently, they are unable to translate organization knowledge into accurate, insightful, and forward-looking scenarios. Other obstacles include: the increasing complexity of the organization, more rapid decision cycles, the unpredictability of markets and the economy, and the inability to determine financial outcomes for individual scenarios or the overall plan. The solution to these planning challenges lies in a holistic planning methodology that once employed generates maximum profit, cash flow, and return on assets, while eliminating siloed planning views and partial financials. That solution is Integrated Business Planning (IBP). How Can Integrated Business Planning Impact Decision-Making? Integrated Business Planning (IBP) is a means for already efficient organizations to further differentiate themselves from their competition. Dynamic, multi-dimensional planning integrates the intelligence of an entire company, enabling planning managers to better evaluate data so that they can fully understand the financial impact of their decisions. By implementing IBP across an enterprise, business units/departments can engage in planning processes that inform the plans of other areas of the business; this includes linking strategy to operational planning and budgeting. Through IBP, decision-makers can explicitly evaluate uncertainty, effectively use historical data and limited information, simulate complex systems, and optimally allocate scarce resources. The core driver of IBP is an enterprise strategy model that accurately and realistically represents the company�s situation on a past and forward-looking basis. The model�s analyses consider key strategic variables such as demand expectations, pricing and elasticity, competitor behavior, emissions regulations, future input, and labor costs. These variables are then mapped to key operating processes (capacity, capabilities, constraints), and economic performance (profit, NPV, cash flow) to determine the best decision for each scenario. Scenarios can then be segmented and analyzed by customer, product portfolio, network redesign, long term recruiting and capacity, and mergers and acquisitions. This advanced, multi-dimensional business modeling enables managers to accurately project the financial outcomes of potential actions or plans, prior to execution. Another key advantage provided are the insights revealed during this process. Most IBP early adopters have significantly altered and optimized their business processes. Core processes, costs behavior, constraints, and financials are accurately represented at the right level of detail, replacing previously made assumptions. This enables managers to focus more time on structuring and analyzing strategic alternatives and corresponding variables. Models consider multiple variables and solve for many outcomes simultaneously. Managers can model and quantify the impact of multiple strategic initiatives simultaneously. This allows managers to evaluate strategic initiatives as a dynamic portfolio rather than as ad-hoc policies. The core IBP model enables decision-makers to make their decisions while knowing the most accurate projection of economic impact (while at the same time understanding the impact of individual metrics). Everyone is singing from the same book � managers can run their own scenarios to establish base projections, assess new ideas and evaluate different strategies, and equally, individual groups can run and analyze scenarios. This is all done without disrupting the official strategic plan. When new ideas are accepted as viable strategies, they are included in the most current �un-official� strategy planning model, which is maintained by the corporate strategy planning team. The team alerts executive staff when this plan is modified so that they can assess strategic initiatives and incorporate them into the dynamic portfolio. Managers can understand the best choices from a universe of choices. IBP technology provides the ability to model large scale, long-term decisions, as well as short-term activities. Scenarios are delivered using a number of options with varying levels of detail, such as products, timeframes, workflows, access rights, and more. Each scenario can link to an enterprise�s strategic and operational planning activities. Who Is Using Integrated Business Planning Technology? Best practice organizations use the Integrated Business Planning strategy model as a core planning driver for operational planning, sales and operations planning (S&OP), financial budgeting, and forecasting. These companies can simultaneously optimize operational plans, S&OP (or capacity planning in services), and financial planning initiatives to the best economic outcome, while maintaining acceptable levels of risk. A well-known, Fortune 1000 consumer packaged goods manufacturer experienced significant growth over 10 years. In addition to exponential sales increases, the company�s accelerated growth increased the firm�s operational complexities. While the company was proud of its continued growth, many senior executives became frustrated by their inability to make big picture decisions. To address this issue and improve operational agility, the company deployed integrated business planning capabilities that enabled corporate executives, business unit heads, and operational planning managers to conduct what-if analyses and identify the strategies and tactical plans with maximum economic impact. Since deploying the IBP solution, the company improved its competitive position and has realized multi-million dollar improvement in profits. Additionally, several high-value strategic insights were discovered during the planning process. These insights allowed managers to strengthen the company�s performance and deliver significant stakeholder value. The company�s vice president of planning indicated that his deployment of Integrated Business Planning technology has delivered a return on investment in excess of 2,000%. Carlos Centurion came to River Logic after 8 years with McKinsey & Company where he was a co-leader of McKinsey�s High Tech Marketing and Sales knowledge development practice. Mr. Centurion was also the co-author of a series of reports on pre- and post-merger management for the Corporate Finance practice. He received a BA in Economics and a BS in Business at Wake Forest and his MBA from INSEAD in Fontainebleau, France. Mintzberg, H., The Rise and Fall of Strategic Planning, New York: The Free Press 1994. Note: Mintzberg refers to the Harvard Policy Model as the Design School Model. Steiner, George A., Strategic Planning, New York: Simon and Schuster, 1979. McKinsey Global Institute, Improving Strategic Planning Survey, 2006. Centurion, C., "Impacts of Business Planning Technology", DSSResources.COM, 10/02/2009. Donna Martinez, Director of Marketing, River Logic, Inc, provided permission to archive and feature this article at DSSResources.COM on August 31, 2009. This article was posted at DSSResources.COM October 2, 2009.